Across Victoria, a number of schools are involved in the New Pedagogies for Deep Learning program. This exciting program is a global partnership that focuses on implementing deep learning goals across whole education systems to enable new pedagogies accelerated by technology. 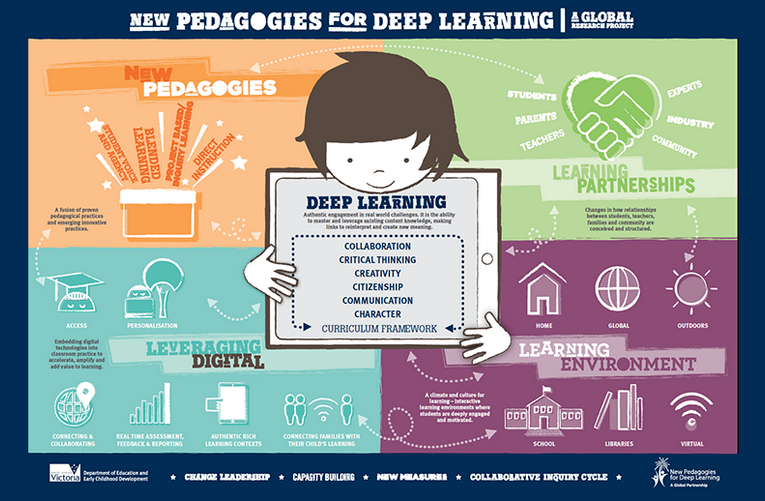 The New Pedagogies for Deep Learning initiative brings together 1,000 schools from ten countries. In Australia, participating schools comprise 79 from Victoria and 21 schools from Tasmania. The measures for deep learning are built around six competencies – collaboration, creativity, citizenship, communication, critical thinking, and character. Since the commencement of the program schools have been working to determine the path to engage students to develop skills to be lifelong learners; creative, connected and collaborative problem solvers who can successfully participate and innovate in our increasingly connected world. Schools are defining their approaches to develop deep learning competencies that go beyond 21st Century skills and work towards design and practice in teaching and learning that will lead to more successful futures for students. One of the key global leaders of the New Pedagogies project is Michael Fullan. Michael advises policymakers and local leaders around the world in helping to enrich and enhance every child’s learning experience. A prolific award-wining author, Michael received the order of Canada in 2012. He holds honorary doctorates from several universities. Michael’s work on educational reform has led to improvements in literacy, numeracy and school graduation rates, while closing gap at schools to impoverished areas. A great opportunity to hear Michael Fullan is coming up at ACMI on Wednesday 29th October. Michael will be at presenting on ‘New Pedagogies for Deep Learning – a Global Partnership’, along with Tony Mackay, MC. This session commences at 9:30am and concludes at approximately 11:30am. Morning tea is provided after the session. This session is designed for school leaders and teachers who are striving to develop learning experiences that go beyond the surface and identify a framework for deep learning competencies.